Prota AE, Magiera MM, Kuijpers M, Bargsten K, Frey D, Wieser M, Jaussi R, Hoogenraad CC, Kammerer RA, Janke C, Steinmetz MO. Structural basis of tubulin tyrosination by tubulin tyrosine ligase. J Cell Biol. 2013 Feb 4;200(3):259-70. doi: 10.1083/jcb.201211017. Epub 2013 Jan 28. Tubulin tyrosine ligase (TTL) catalyzes the post-translational retyrosination of detyrosinated α-tubulin. Despite the indispensable role of TTL in cell and organism development, its molecular mechanism of action is poorly understood. By solving crystal structures of TTL in complex with tubulin, we here demonstrate that TTL binds to the α and β subunits of tubulin and recognizes the curved conformation of the dimer. Biochemical and cellular assays revealed that specific tubulin dimer recognition controls the activity of the enzyme, and as a consequence, neuronal development. 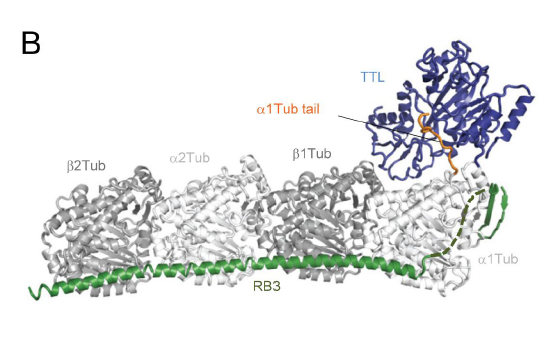 The TTL-tubulin structure further illustrates how the enzyme binds the functionally crucial C-terminal tail sequence of α-tubulin and how this interaction catalyzes the tyrosination reaction. It also reveals how TTL discriminates between α- and β-tubulin, and between different post-translationally modified forms of α-tubulin. Together, our data suggest that TTL has specifically evolved to recognize and modify tubulin, thus highlighting a fundamental role of the evolutionary conserved tubulin tyrosination cycle in regulating the microtubule cytoskeleton.